Piano Opening Hours: Daily 24/7. 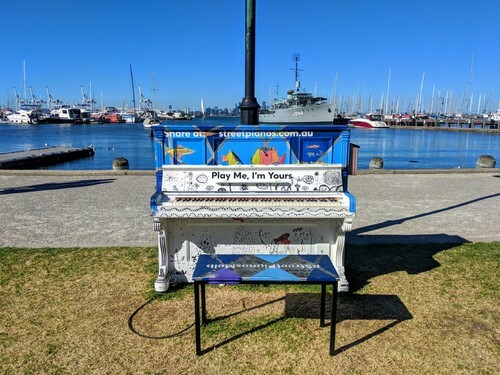 Piano donated by Sharon Herbert and decorated by Western English Language School, Footscray Campus, with thanks to Piano Project. Hosted by Commonwealth Reserve. My husband and I moved onto a boat 3 years ago. 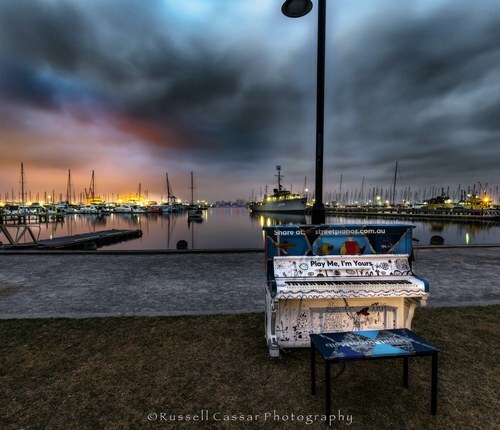 My only reluctance was that my piano couldn't come on board with us. 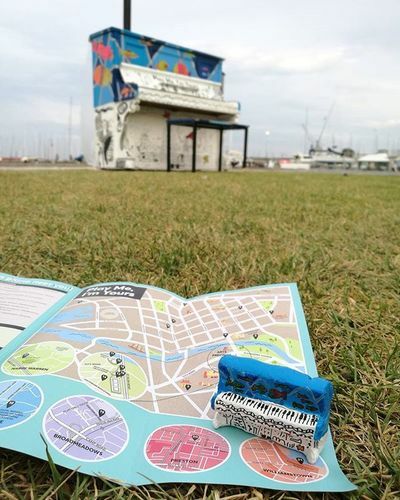 We moved to Melbourne yesterday and here, directly opposite the boat, I found this piano! It made my day!! Heart broken to find it gone after my first day of work today.. back to the electric keyboard then! Thank you for the lend! My and my friends’ families both spent a wonderful day at williamstown today. It’s been almost 5 years since I have brought my daughters to visit there as we moved house to live in the east, i used to bring my daughters there and have a walk along the beach with them in the pram , have a picnic in the shade of one of the big trees in the park nearby the jetty. That’s when we still lived in the west side of melbourne and we first came to Melbourne from overseas . 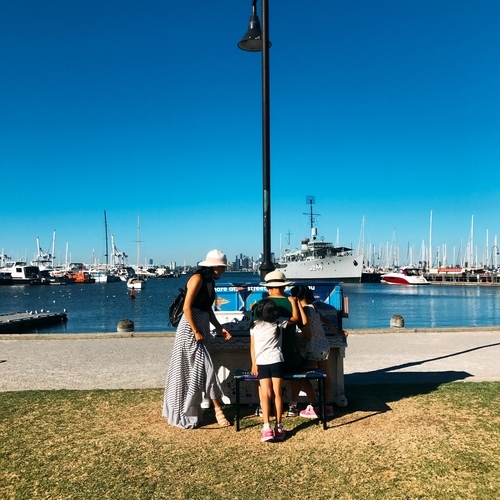 it’s about an hour’s drive from my current house to williamstown, not that far, but we just had too many other great places to explore in Melbourne with two little courious hearts and we almost forgot going back to williamstown one day . 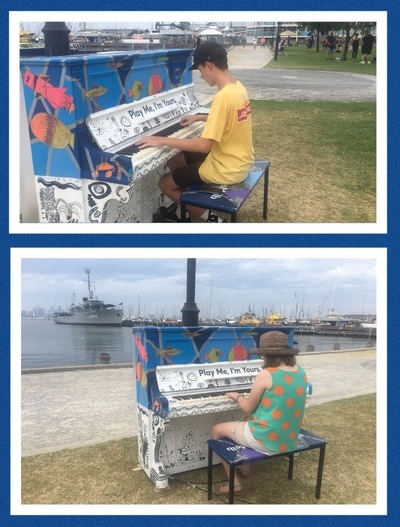 This street piano has brought us back to williamstown since our last visit to there about 5 years back. What could I say ? One of the most wonderful places in Melbourne, great weather , great location and great food! Today we even had the best accompanies! Besides our humorous , smart , caring and cheerful friends and their sons, we also met some other wonderful people at the piano. Including a lovely couple who played so sweetly together while the girl taught the boy a song very patiently ; a big family whose 3 generations were gathering at the park nearby, one lady herself is the art teacher from WELS who has completed the painting work of the piano together with 40 of her students, and her daughter played really beautifully , including one of my favorite songs: someone like you . The granny even played a little bit and she was very kind to ask her grand daughter to play one piece just for my daughter, since she missed listening to the fabulous performance by the teenager girl. Life is about come and go, life is about meet and depart ,life is about being nice to everyone you meet and creat some unforgettable memories to each other , until we have to say good bye and start the next journey. Life is about being at this moment . And I am so glad that I seized the moment so truly today ! Life is about remembering the past , and I am so grateful that I still remembered my past good memories at williamstown while creating new memories today ! I really hope the piano can stay there forever , so that it can witness so many different come and go , meet and depart. At williamstown, At Melbourne, in Australia, in this world . Until forever. A cover of ‘Where Is My Mind’ by the Pixies. Composition by Maxence Cyrin. I was really nervous playing with so many people around, and made a few mistakes, but I hope you enjoy! Shot this today. Great location. We were in the area for my son's baseball game and came into Williamstown for lunch. 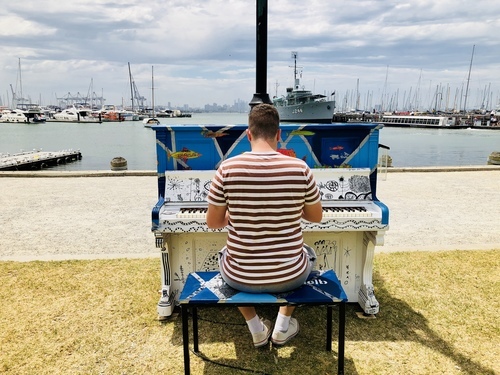 While exploring the Sunday Market, we came across your lovely piano. It was popular and we had to wait for our turn. My girls played a couple of songs from their Suzuki lessons. Hope the ladies sitting on the park bench enjoyed my rendition of “Superman” by Five For Fighting. Western English Language School (WELS), located in Melbourne, Australia, is a government primary and secondary coeducational school. It provides newly arrived students in the South-West Victoria Region with their first experience of an Australian school. With thanks to Piano Project. In order to post your videos or film clips on this website you must upload them to YouTube (or Vimeo) first, then copy and paste the web address or share link in the box below. Watch this short video tutorial for more help.